With the cold and flu season peaking, I thought it might be a good time to review natural ways of supporting our immune systems. (Listen to my recent Clinical Focus podcast on the subject of Immune Support, as well as a great recent podcast interview with Dr Tom Guilliams). 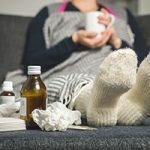 The Annals of Internal Medicine recently issued a clarion call to doctors to avoid using antibiotics for viral infections—as if they shouldn’t already know! Ordinary colds and flus, and even bronchitis and sinusitis that are not threatening to escalate into serious bacterial infections, shouldn’t be treated with powerful antimicrobial drugs. 1) Vitamin A: Both the retinol and carotene forms of vitamin A play major roles in immune response. That role is so profound that world health officials estimate that vitamin A deficiency is responsible for the deaths of hundreds of thousands every year in the Third World. Teams of health workers go into the field and administer high-dose vitamin A to children in an effort to fend off blinding eye infections, measles, and diarrheal diseases. And a new project is underway to bio-engineer “Golden Rice,” rich in vitamin A. The carotenes (alpha carotene, beta carotene, lycopene, lutein, etc.) are also implicated in immunity. 2) Vitamin C: In classic vitamin C deficiency (scurvy) the body becomes extremely vulnerable to infection. I recently reported on a new study by my colleague Dr. Carol Johnston at the University of Arizona showing that vitamin C shortens the duration of colds and improves the fatigue of cold-sufferers. In my practice at the Hoffman Center, high-dose intravenous vitamin C is the mainstay of my approach to viral infections like mono, hepatitis, and shingles. 3) Vitamin D: Dr. John Cannell, world famous for his vitamin D research, first came to appreciate D’s role in immune-enhancement when he noticed that patients whom he had dosed with vitamin D had fewer and milder flu episodes. After I optimize my patients’ vitamin D levels, many report that they’ve never been so free of upper respiratory infections. D works in part by promoting the body’s production of cathelicidin, an anti-microbial peptide. 4) Vitamin E: Elderly subjects especially may benefit from vitamin E since it enhances both humoral and cell-mediated immunity. 200 International Units daily was found to be effective in protecting nursing home residents from the common cold. 5) B Vitamins: A deficiency of B6 has been shown to depress immunity; lack of adequate vitamin B12 and folate can cause megaloblastic anemia that depresses white blood cell counts; and thiamin, riboflavin, and pantothenic acid each play a supporting role in optimal immune response. 6) Iron: Commonly deficient in women, iron is essential for the cells that make up our immune defenses. But it is also an important nutrient for bacteria, so care must be taken that iron supplementation doesn’t stoke infections. I generally prefer dietary iron to high-dose iron supplements in conditions like colitis, sinusitis and cellulitis. 7) Selenium: Sometimes referred to as “a birth-control pill for viruses,” selenium has been shown effective against cytomegalovirus and HIV. It may have cancer-protective effects and it is a co-factor with glutathione to quash damaging free radicals. 8) Zinc: Crucial to immune defense, zinc is effective in countering a wide gamut of pathogens, including the common cold (hence the popularity of zinc lozenges). Caution must be taken with zinc because high doses (>150 mg/day) have been shown to be immunosuppressive. 9) Probiotics: There is more immune tissue in the GI tract than anywhere else in the body. Crucial to optimal immunity is the “cross-talk” that takes place between healthy bacteria in our intestines and lymphoid tissue that lines the gut wall. Experimental animals whose GI tracts have been rendered sterile have poor immune defenses; humans whose intestinal flora has been damaged by repeated doses of antibiotics also exhibit lowered immune response. Additionally, probiotics compete with harmful bacteria and keep them from proliferating. 10) Garlic: Supplementation with Aged Garlic Extract has been shown to enhance the function of critical defensive white blood cells, and shorten the duration of colds and flus. Garlic may also enhance immune system surveillance against cancer. 11) Beta Glucans: Various fungus-derived polysaccharides promote immune response. They are typically obtained from medicinal mushrooms like reishi, shitake, and maitake, or nutritional yeast. In Japan, a supplement called AHCC is the number one-selling nutraceutical, and is routinely prescribed to cancer patients to bolster their immunity while undergoing conventional therapy with chemo or radiation. It possesses significant activity against a wide variety of viruses, including the flu, hepatitis, and HPV. 12) Echinacea: Perhaps the most widely-used Western herb for immune-enhancement. Echinacea compounds have been found to boost production of immune chemicals that stimulate macrophages, the white blood cells that track down and engulf microbial invaders. Controversy persists over its role in protection against colds and flus; detractors are accused of invoking poorly-designed studies to challenge its efficacy. 13) Astragalus: A traditional Chinese herb used for viral infections, studies have confirmed its effectiveness in preventing and shortening the duration and intensity of common colds. Astragalus has also been proposed as an antidote to the immunosuppressive effects of chemotherapy and radiation. 14) DHA: Once thought to have a negative effect on immunity, Omega 3 fatty acids like those found in fish oil have been newly embraced for immune support. Docosahexaenoic acid (DHA) in particular has been shown to enhance the production of infection-fighting antibodies and cytokines. 15) Colostrum/Transfer Factor: The “first milk,” critical for priming immunity in newborns, has found application to immune support in adults. Used extensively in agriculture to safeguard young livestock, bovine-derived colostrum andtransfer factor can help reinforce human defenses. 16) Thymic Extracts: The thymus is a crucial organ that coordinates immune response. Helper T-cells and natural killer cells originate from the thymus. Peptides derived from thymus like Proboost have long been used to promote resistance. 17) Ginseng: In China, it’s a favorite gift of children to their elderly parents, especially when winter flu and cold season looms. Panax ginseng bolsters immunity in a variety of ways. Evidence supports its use against both infectious diseases and cancer. I hope this list helps you safeguard yourself against illness this cold and flu season. As always, I want to remind that it’s important to take these supplements in the right amounts, based on your individual needs, in consultation with your trusted medical professional. I also want to remind all my readers that one of the best ways to avoid infection is simple hygiene – be sure to wash your hands regularly, especially before touching your eyes, nose, and mouth. If you’re already sick, regular handwashing can help prevent the spread of your illness as well. Stay tuned to Intelligent Medicine for more tips for staying healthy, and for more information on these developing health concerns.